New building for the ETS school in Griffintown. It's "La Maison des étudiants" (The Student House). Previously, there used to be an empty lot there. Does anyone like this building? I'm sure it looks great from the inside but this leaves me cold. 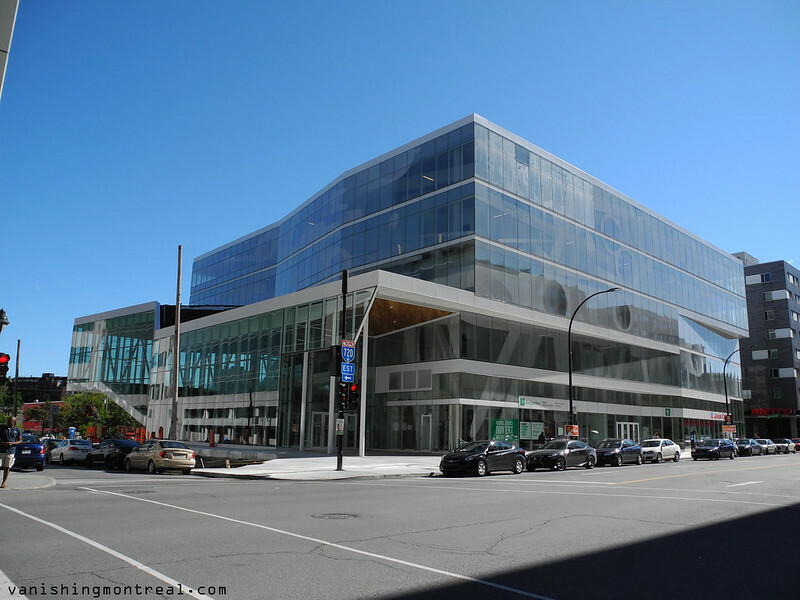 The Caisse Desjardins branch and the pharmacy also sorta destroy the uniformity of the modern design. Nouveau bâtiment pour l'ETS dans Griffintown. C'est "La Maison des étudiants." Auparavant, il y avait un terrain vide. Est-ce qu'il y a quelqu'un qui aime ce bâtiment? Je suis sûr que c'est très beau à partir de l'intérieur, mais cela me laisse froid. La branche de Caisse Desjardins et la pharmacie détruisent également l'uniformité du "look" moderne. It looks like another half-assed project. It's like a weak dilution of what it could have (and should) look like. Take a look at the Telus Garden building in Vancouver that was the bane of my commuting existence for a few years while it went up. Lots of glass. But the giant etched glass leaf as an entrance and covered outdoor café area is really impressive and the blocks of windows shape the building. Unlike this thing. The windows look like they were arranged like that simply because the architect was working with wholesale window frames and s/he couldn't be arsed enough to design anything more interesting. And the glass already looks dirty. If the building was dull, well, then, that's pretty much par for the course for Montreal buildings, it seems. But this thing looked like it was trying to do something with a bit of 'oomph' and the architectural ennui set in too quickly in the design stage. Like many new buildings, it probably looked good on paper, but once it was built the reality sets in. Just another mediocre building, certainly not the worst I've seen, but certainly not the best.If it had a ring of nice mature trees around it, it might look much more inviting. I see these new airy buildings all over higher education campuses. The sun can be punishing. At one building, they had to cover half the windows with a huge "sail" so students coukd see computer screens and not get sun burns working long hours sitting at tables. There is such a thing as too much glass! I agree with all the comments!